Now these are animated and in the game. With this major task complete, that means one less major task to think about! We’re getting super close, just a few weeks left till we’ll be wrapping up. Also, in the last few weeks I implemented a quick ‘n dirty localization system so the game will be able to be in multiple languages. Next on my to-dos is to finish the NPC animation in the Donut Segment. I’ve been posting a Devlog for our current game project Donut Get! for a while over at the TigSource Forums. I just posted over there and I’m doing a re-post here. Last time I posted I was animating the cop and got super frustrated when I couldn’t test the animation and the game wouldn’t compile. After that, I finished animating the cop and the game was brought to new life. The following are a couple examples of how the artwork for the car portion of the game was created. I used these sketches as reference when doing the vector linework for the game. I imported the linework into Photoshop and added some color for the final look used in game. I used textures to bring some life into the flat colors of the artwork. Simple gradient overlay makes it look fancier than it is and gives a “night-time” effect. For the past couple weeks I’ve been animating characters for the donut portion of the game and polishing gameplay. Shown in this animated gif are Mr. Sprinkles and Officer Brown. Mr. Sprinkles is an NPC that will hang around and grab donuts as well. I finally implemented new elements to the gameplay. Your objective is to eat falling donuts but you now have to dodge falling debris. Now that I started getting NPC animation in, I started filling in their different behaviors (like Mr. Sprinkles eating donuts). The story is unfolding as gaps are filled in, I look forward to finishing the animation for the remaining NPCs. David Rodriguez is just about done animating the fighting game segment. Tonight he sketched out some storyboards for a couple cinema scenes related to that segment. I’m very excited to have his animation in the game and playable! It’s that time of month again! The time when I announce our Downtown LA Art Walk show at the very last second! (right before I run a couple blocks and set everything up). 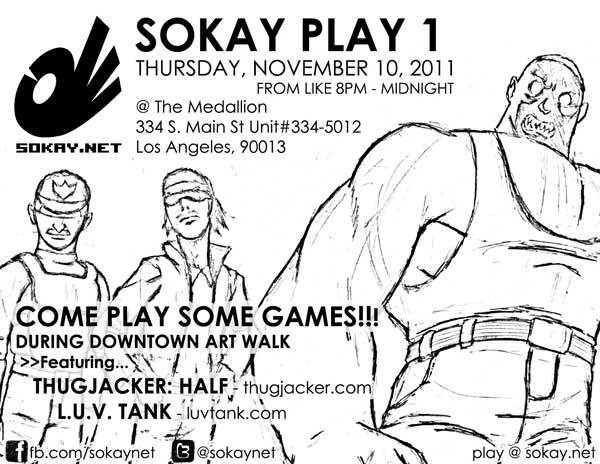 We’re showing some games again this week at the Downtown Los Angeles Art Walk! This time we’re debuting Rush Hour Plus from our Chris Rock! Showing some games again this week at the Downtown Los Angeles Art Walk! Earlier this month we showed Thugjacker and LUV Tank at a gallery space during the Downtown Los Angeles Art Walk, once again. This time I managed to set up the night before. A Sokay Play flyer in the Urban Noodle window. Some peeps checkin out LUV Tank. We used our projector this time since we got a feel for how the setup would be. Thursday, December 8th, from like 8pm-Midnight. Sokay Play 1 came and left quickly. Through the organization of an art show by my homie John “Alter Native,” I was able to show some games during the Downtown Los Angeles Art Walk last month. I had Thugjacker and LUV Tank on display. Here are some photos! Some strangers giving the game a shot! My Urban Noodle dinner on the table, along with some empty wine cups. haha! Brian is legitimately excited to be playing LUV Tank. Haha! Time to clean up! Rebekah starts taking down her stuff. The galleries are calling it a night! I’m grateful that I had a lot of friends show up and got the opportunity to discuss the games one on one with a lot of people. We’ve actually got another show coming up soon on December 8th! Same place, I’ll have the flyer ready soon. I’m showing Thugjacker and L.U.V. Tank during the Download Los Angeles Art Walk this week. A friend arranged getting a booth and I joined in, been scrambling to get things prepared! Looking forward to seeing the games out in front of people again! The stats say that lots of people play our games, but it’s always a different story seeing people experience them. For more info on the Reality Prevention Consortium event, check out its Facebook Event page.